Chow Yun-Fat asks questions later in Let the Bullets Fly. Asian superstar Chow Yun-Fat (Crouching Tiger, Hidden Dragon) stars in China’s biggest-ever domestic box office hit, the comedy-action-western mash-up movie Let the Bullets Fly. In the lawless rural China in the 1920s, the notorious bandit chief Zhang (director and co-writer Jiang Wen) descends upon a remote provincial town posing as its new mayor, an identity that he has hijacked from Old Tang (Ge You), himself a small-time imposter. Hell-bent on making a fast buck, Zhang soon meets his match in the tyrannical crime lord Huang (Chow Yun-Fat) as a deadly battle of wit, brutality, double- and triple-crosses, and many thousands of bullets ensues. 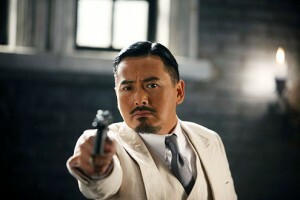 Nominated for nine Golden Horse Awards (Taiwan’s equivalent of the Oscars), including Best Film, Best Director and Best Actor (Chow Yun-Fat), the unrated Let the Bullets Fly opened in limited run in U.S. theaters in March, 2012 to positive reviews, most of which noted its deliriously effective mix of dark comedy and eye-popping violence.